Hello my friends and Happy Sunday. I have some great News to share with you. 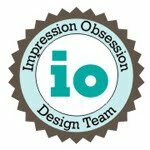 I was chosen to be part of the new Design Team for Stamp Something Blog Challenge . A new challenge is posted every Friday with great prizes too. I hope you can join me there. Sweet Little One and Friends. Happy Saturday my friends. I hope you are having a great day. I spent my last few days playing with DD Hide and Seek, Tag You Are In, Babies, Coloring, Watching movies, Baking cupcakes and Eating Ice Cream,!! So healthy, LOL!! and not stamping at all!! We are having so far the hottest days of Spring, yesterday we got 96F at 11:00am, really hot. I also spent some time gardening, well working on my pots, I don't have a real garden yet, we hope soon. Sweet little one: I used again a digi image from Dustin Pike, colored it and cut it out. 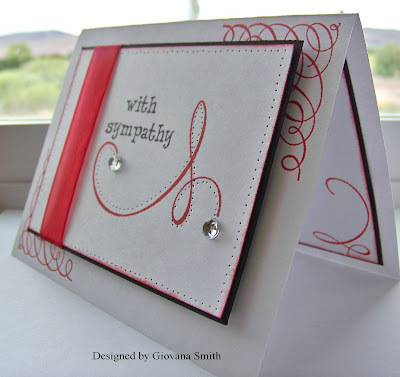 The sentiment is from Combo Sentiments by smARTworks. 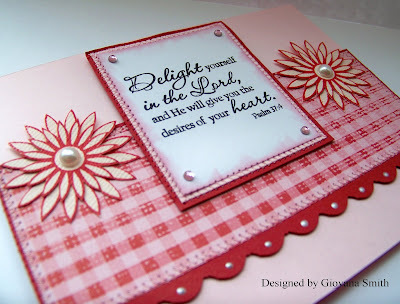 My card is based on a sketch from Clean & Simple Blog. Accessories: stamp-a-ma-jig, SU Dimensionals, Prismacolor Pencils, OMS, Mini glue dots, sponges. 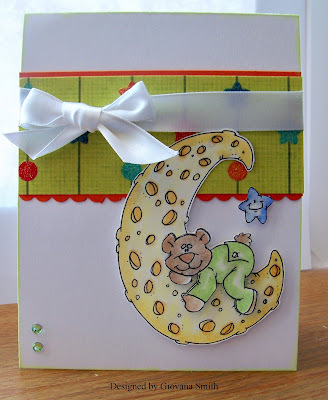 Friends: I think this card is really cute, no layers, no sewing, no dimensionals, LOL. I stamped the image from ABC-Fresh Picked Set by smARTworks onto White CS using Stazon Black Ink. It was colored with Prismacolor Pencils and OMS. 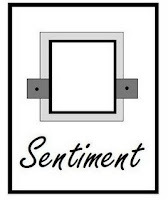 The sentiment is also from Combo Sentiments by smARTworks. Ink: Stazon Black, Real Red. Embellishments: PTI Sweet Blush Ribbon, Pink Rhinestones (Kaiser Crafts). 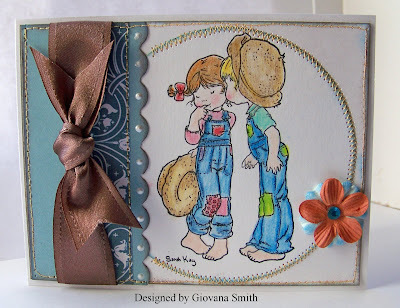 Accessories: stamp-a-ma-jig, Prismacolor Pencisl, OMS. Remember, you can get these stamp sets at smARTworks, and if you got inspired by ME, please don't forget to mention my name in your order, Thanks!! Please, come back tomorrow for some exciting NEWS!!! Labels: Dustin Pike Digi Images., smARTworks stamps. Hello my friends, it's time to announce our next Tea Party Challenge Theme. This time Trish is hosting the party and challenging us to use any color but White. 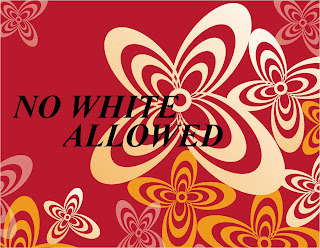 So NO WHITE ALLOWED this time, she kindly let us know that is Ok to use a little bit only if this comes from your patterned paper. 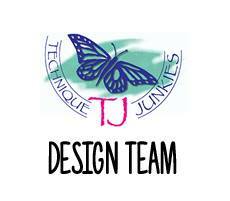 Next week we will post our creations. I hopw you can play along with us too!! You have a whole week to think about this challenge. If you don't have any smART rubbah, feel free to use any stamps you have. Now, while I wait for next week, I will show a card that allows White, LOL. I created this card using a sketch from Stamp Something Challenge Blog. I used a couple of set from smARTworks. The image is from SHB-01 Set and the sentiment is from LOL Set. 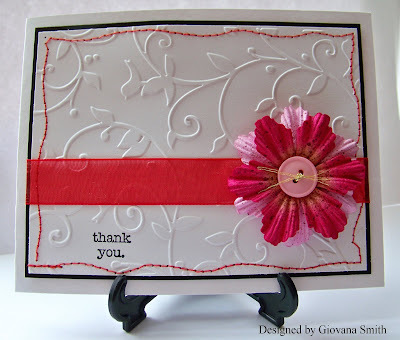 Card Stock: Kraft, Pink Pirouette, White, Red, Berry Sorbet. Accessories: Sewing machine, Pink Thread, SU Dimensionals, stamp-a-ma-jig. Happy Tuesday my friends. I hope you had a great weekend and family time. DH prepared a great BBQ on Sunday, he was the Chef and I helped him, LOL. 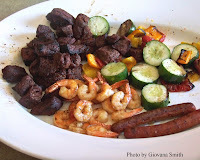 His BBQ was great, he tried a couple of recipes from Food Network. 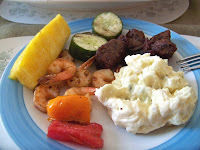 We also eat Potato Salad, Grill Pineapple, Grill Veggies. DD doesn't like BBQ , can you believe that??? she prefers Hot dogs instead!! Yesterday a friend of us invited us to her BBQ and also a Birthday Celebration for her little daughter. DH had a great time with the guys and DD enjoyed her time playing with other kids, she spent a lot of time playing in the sand box, OH MY!! she was covered form head to toe with sand, she got a little tan too, yesterday was a hot day: 88F. Anyway, I am happy today I had some stamping time. I played 3 challenges in 1 : MojoMonday Sketch 88, Color Combination Challenge ; this time: So Saffron, Bashful Blue and Pumpkin Pie and Our Creative Corner Challenge: Using a sentiment as a focal point. I made a cute baby card. This is for a friend from church who recently had a baby boy. 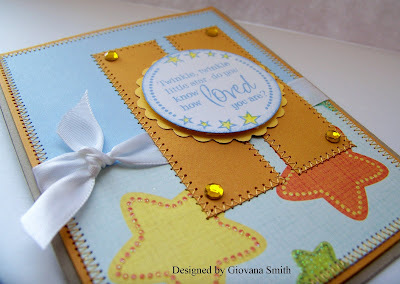 Stamps: Little Star by Verve. Embellishments: Rhinestones (kaiser Crafts), Offray White Satin Ribbon. Accessories: Sewing machine, yellow thread, SU Dimensionals, Prismacolor Pencils, OMS, scallop scissors. 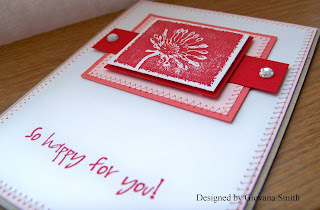 Labels: Blog Challenge, Mojo Monday, Verve Stamps. Hello my friends!! I hope you are having a great day. I am so sad I missed the new Verve release Party, but I played one of the Sketches posted on Julee's Blog. I am glad to say that I own several set from Verve, but one of my favorites is "Some bunny", so I decided to use this one and played the sketch. 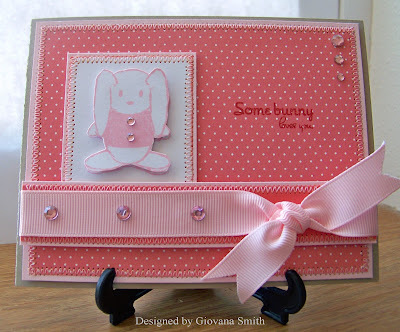 My card base is Kraft CS, My second panel is Pink Pirouette CS and Pink Patterns DP from PTI as well as the ribbon. 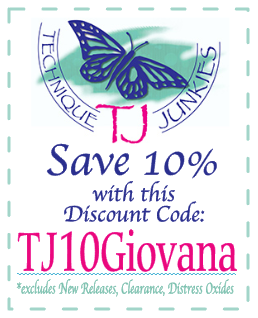 The image is from VERVE and was stamped in Pretty in Pink Ink. The sentiment was stamped in Real Red. A lot of stitches around and Pink Rhinestones!!! Ink: Pretty in Pink, Real Red. Accessories: Sewing machine, Pink thread, SU Dimensionals. Happy Saturday my friends. It has been a very slow day for me. This afternoon I made a baby card that I want to share with you. 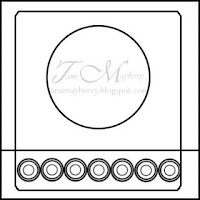 This cute image is a free digital image from Dustin Pike. He has really cool images for free. I really love this cute bear!! I colored it with Prismacolor Pencils and blended with OMS. The sketch is from Heather Scott . Card Stock: White, Tangerine Tango. Accessories: Printer, Scallop scissors, SU Dimensionals, Prismacolor Pencils, OMS, Mini glue dots. Labels: Blog Challenge, Dustin Pike Digi Images. Happy Friday!!! I hope you are starting a great day and an awesome long weekend. DH is planning some BBQ ,yummy!!! But for now let me show a cute card I made for Fun-Frilled Blog this time the challenge was to create a project using Blue, Red and White. I used an image I got from the Wish Rak group on SCS, this one is from Whipper Snapper Designs. Isn't this teddy bear cute??? I colored it with Prismacolor Pencils and blended with PC Colorless Blender. The Dp is from a huge package I got many years ago I don't have the name now. Card Stock: White, Blue, Riding Hood Red. Accessories: Prismacolor pencils, Diamond Glaze, SU Dimensionals. Hello my friends!! I hope you all are having a great afternoon. I have a cute card for you this afternoon. I combined 2 challenges in 1: Stampavie Blog Challenge: Using Light blue/Turquoise and brown and Taylored Expressions Cupcake Challenge # 68. The image I used in my card is A Kiss for Chloe (Stampavie). I colored it with Prismacolor Pencils and blended with Colorless Blender Pencil. I added a couple of Prima flowers and a Aquamarine Rhinestone (Kaiser Crafts). The scallop was made with my corner punch. I added some Liquid Pearls (Rangers). All borders were sponged with Light blue and brown ink. The ribbon is from SU Chocolate Chip (retired). The DP is from GCD Studios. My personal touch: A lot of stitches!! Card Stock: White, Baja Breeze. Ink: Black, Licht blue, Basic Brown. 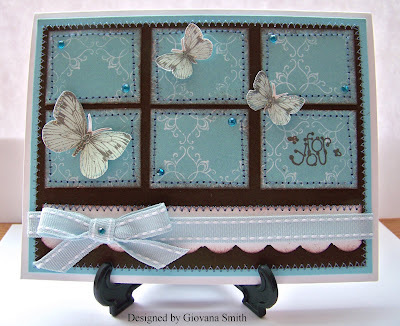 Embellishments: SU Chocolate Chip Ribbon, Prima flowers, Aquamarine Rhinestone ( Kaiser Crafts), Liquid Pearls (Rangers. Accessories: Sewing machine, Yellow thread, corner punch, Mini glue dots, sponges. Labels: Blog Challenge, Stampavie Stamps. Hello my friends!! Thursday is MDC Challenge day. 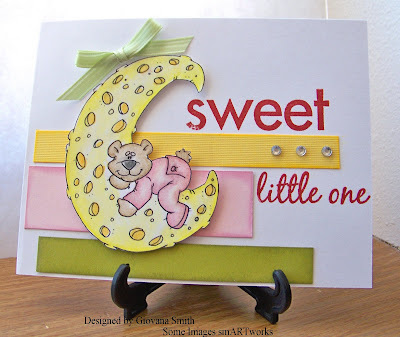 Our challenge this week is to create a card with a popped up or layered image. For my card I used Baby Powder-Fuzzy Jammies paper from Imaginisce, this is a double sided card stock, I used both sides for this card. 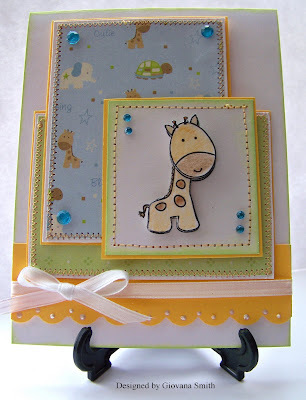 The image is Giraffe Snag'em Collection from Imaginisce Stamps, stamped 3 times and layered. I also used Aqua Rhinestones from Kaiser Crafts and White Opal Liquid Pearls from Ranger and a lot of stitches!! Ink: Stazon Black, Pistachio (Color Box) for sponging. Embellishments: Offray White ribbon, Aqua Rhinestones (Kaiser Crafts), Liquid Pearls (Rangers). Accessories: Sewing machine, Yellow thread, Corner punch (for scallop border), sponges. You can play the challenge with us too!!! Head over to the MDC Challenge Blog, enjoy the other DT members creations and also check out the prize you can win if you play along with us!! Hello my friends!! 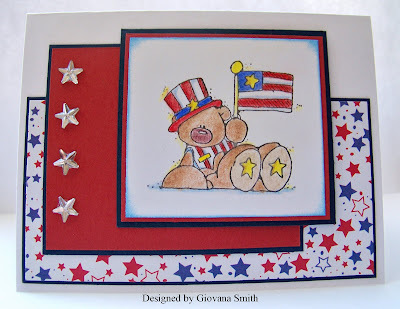 Second post today to show you a quick and cute Happy Birthday card. Next Monday is my oldest sister Birthday. She is the awesomest sister ever. She is like a second mom for me!! I love and miss her very much, although we talk online quite often. I wish I could be in Peru and give a HUGE HUG!! 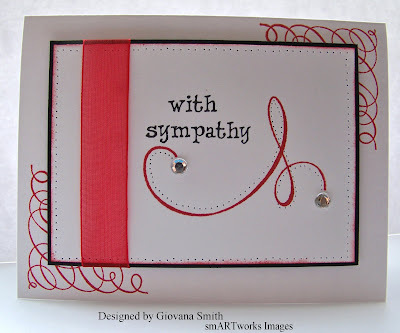 This card is for you Patty!! 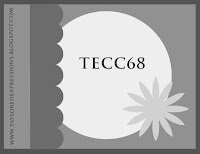 My card is base on a sketch from GCD Studios. My card is 7" x 3.5". I used Swirls Paper from Chianti Collection (GCD STudios) as my Back ground and added a piece of White CS on top, I sponged the borders with Real Red Ink. I also cut a long piece of the same paper and folded and added the ribbon attached with staples. The flowers are from Prima: Urban Painterly Petals. Sentiment is from smARTworks Stamps: Tulip Square Set. The rhinestone is from Target $ spot. Ink: Real Red, Stazon Black. 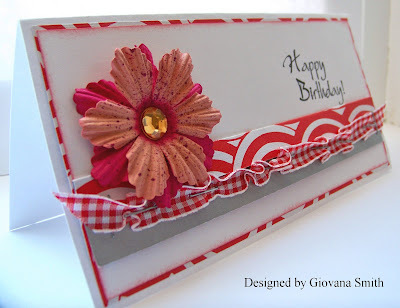 Embellishments: Prima flowers, Rhinestones, Gingham Red Riboon(The Paper Studio). 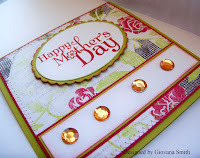 Accessories: Sponges, stamp-a-ma-jig, Mini glue dots, SU Dimensionals, Staples. Labels: MDC Store, smARTworks stamps. Tea Party Challenge: Be Inspired!! Hello my friends, it is time for another Tea Party Challenge. 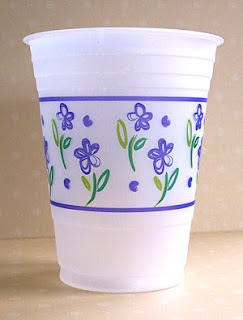 Susan challenged us to use this colorful cup as an Inspiration, so here I go. 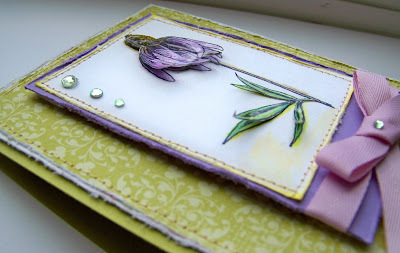 My card base is Kiwi Kiss, I stitched together a piece of White CS and SU Bella Rose DP. The smARTwork set I used is Cone Flowers, it was stamped in White CS using Stazon Back Ink, I colored it with Prismacolor Pencils and blended with Colorless Blender Pencil. This piece was also stitched onto a piece of Lavender CS, then I added some pretty Lavender Ribbon (PTI). Finally I added some Green Rhinestones. Very easy!!! Card Stock: White, Kiwi Kiss, Lavender. Embellishments: Rhinestones(Kaiser), Lavender Ribbon (PTI), Diamond Glaze. Accessories: Sewing machine, yellow thread, 3D-foam (EK-Success), Mini glue dots. Now head over to Susan (for Peggy too), Dina, Trish, Donna, and Donelda 's blogs and enjoy their creations!! 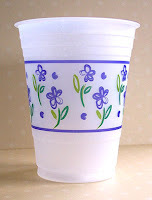 Remember, you can play along with us too, just create a project or card inspired by the cup. You don't need to use smARTworks stamps, but if you have them, ink them up!! Just a quick REMINDER, just in case you like what you see here on my blog and you want to purchase smARTworks stamps based on my creations, don't forget to mention my name, THANKS!!! Hello my friends, it has been a while since I stamped, I did set up my last 4 post and I have been missing stamping and posting here. I had a really bad weekend, I was sick with really bad headaches that made me sicker if I was on the computer. I spent my weekend with my family watching TV and laying on the couch trying to feel better. Also, last Friday one of my uncles in Peru passed away. It was a very sad moment for me. I wish I could have been there. He battled a lung disease and his body after long time fighting gave up. I created this card to send to my aunt (my mom's sister) and let her know I care and I miss them very much. Embellishments: Clear Rhinestones. Organdy red Ribbon. 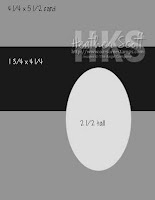 Accessories: 3D-foam (EK-Success), stamp-a-ma-jig, sponges, Paper piercing set. PS: Come back tomorrow and I will show you my creation for our TeaParty Challenge!! See ya. Hello my friends. I hope you are having a great Sunday, rejoicing in the Lord!!! Today I don't have a card for you, but I want to show what I found few days ago in my yard. I was pulling up weed and I found this!! 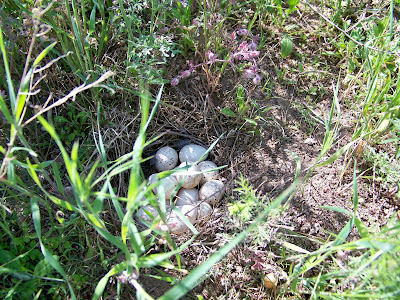 A really cute nest, it has 14 little eggs inside, DH told me this is probably a Quail Nest, isn't this awesome!!! Amazing is the Lord. Hello my friends, Are you enjoying your Saturday? I hope you are. I have a horse card for you today. I made this card using another sketch from Card Patterns. Wow, I think I played Sketches all week!! 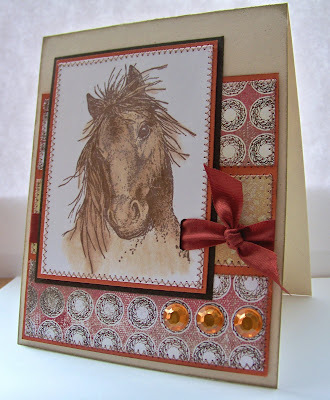 For this card I used Mustang stamp, I colored it with Prismacolor pencils and Colorless Blender pencil. The paper is Rhubarb Tart from Memory Box. The Rhinestones are form the $ post from Target. I need to go again and get more, LOL. Card Stock: SU Naturals, White, Brown, SU Really Rust. Paper: Rhubarb Tart (Memory Box). Embellishments: Martha Stewart Ribbon, Rhinestones. Accessories: Sewing machine, brown thread, Horizontal Slot Punch, Prismacolor Pencils, Colorless Blender Pencil. Happy Friday everyone!! I have a cute a quick card to show you today. I used the sketch from Card Positiong Systems . The flowers are from Prima" Urban Painterly Petals". The sentiment is SU Vases in Vogue (hostess retired). Some red stitches around. Embellishments: Prima flowers, Pink Button, Gold thread, Red Organdy Ribbon. Accessories: Sewing machine, red thread, Cuttlebug, Embossing folder, Mini glue dots, SU Dimensional. Hello my friends, Today I made a special card for my little sister. 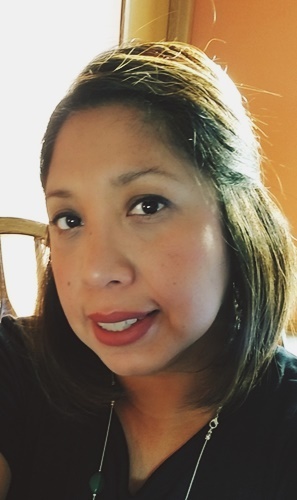 She is an awesome sister, mother and friend. She is having really hard times and in many situations she feels like she can't do anymore, so today I made this card for her!! For this card I used the Mojo Monday Sketch #86 and also the Caardvarks Challenge, using a quote or verse. 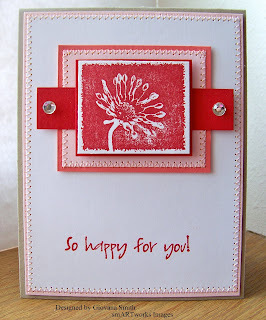 I stamped the flowers from Wishful Elegance on Pink Bazzill CS and then cut them out. I glued them using Diamond Glaze, it works perfect!!! I sponged the Verse with Dusty flum Ink. The scallop border was made with my corner punch. 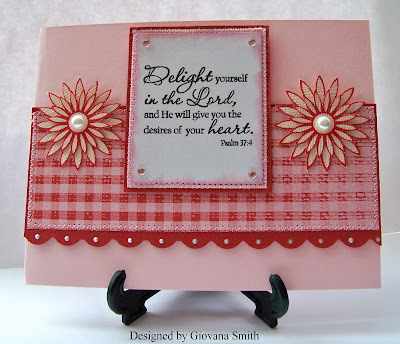 Stamps: Psalm 37:4 and Wishful Elegance by Verve. Ink: Black, Riding Hood Red, Dusty flum (Color Box) for sponging. Embellishments: Pearls (Kaiser), Pink Rhinestones (Kaiser), Liquid Pearls (Ranger). Accessories: Sewing machine, Pink Thread, Corner Punch (for scallop), Sponges, Mini glue dots, SU Dimensionals, Diamond Glaze. Labels: Mojo Monday, Verve Stamps. Hello my friends, I have a cute card for show today. 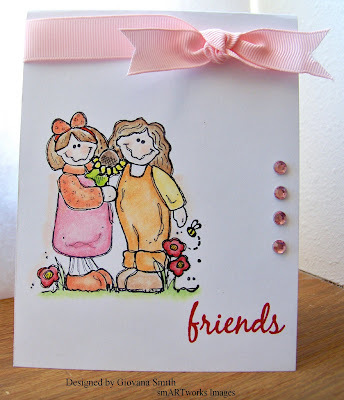 I played the sketch challenge at Card Patterns and also the Friend Challenge at Fun-Frilled Blog. 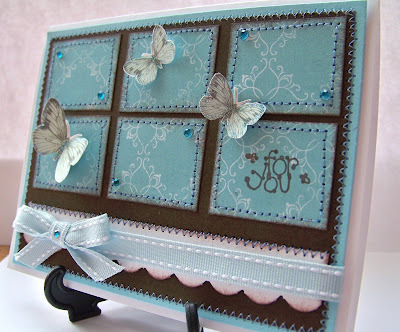 When I started making this card I didn't like it much, but then I changed my mind, it is super pretty!! I made it for a friend of mine who lives in NY and I haven't seen in more than 20 years!!! She is Peruvian too, super cool girl and one of my BFF. Lately we have been chatting online and remembering our time times at school and our crazy and silly adventures too, LOL. 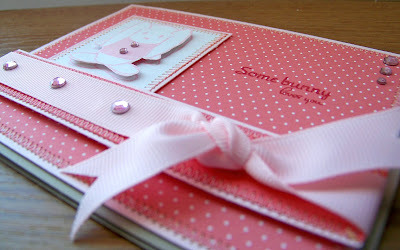 Anyway, for the little squares I used Alissa-Spunky Paper from Bo Bunny. The butterflies are a cut out from Bridgeport Pavilion Pearl Paper from SEI, also added some Waterfall Stickles to the wings. The rhinestones are from Kaiser. A lot of stitches, love it !!! Card Stock: White, Brown, Light blue. Embellishments: SU Ribbon, Rhinestones ( Kaiser). Accessories: Corner punch (for scallops) sewing machine, blue thread, Mini glue dots, Stickles. 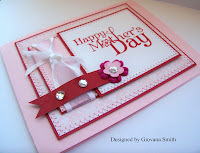 ... to show you a couple of Mother's Day cards I made and I couldn't post before Mother's Day. Oh well, Mother's Day is everyday!!! I used Basket set from smARTworks. Card stock: White, Real Red, Black. 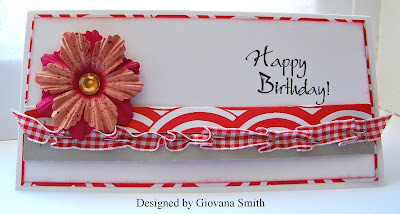 Embellishments: Red Rhinestones (Kaiser), Gingham Red Ribbon (The Paper Studio), Diamond Stickles. Accessories: Mini Glue dots, 3D foam (EK-Success), stamp-a-ma-jig. Card Stock: White, Kiwi Kiss, Black. Ink: Riding Hood Red, Stazon Black. 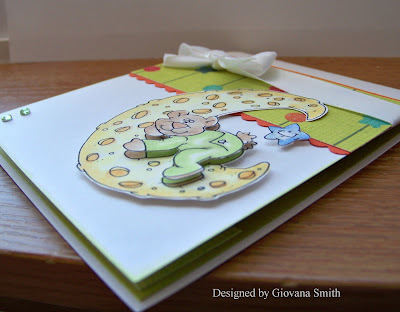 An Inspiration Party and a Baby card. Hello my friends, it's time to announce the theme for our next Tea Party. This time Susan is our hostess and she gave us a great piece as an "Inspiration", take the shape, the colors, the design, etc. Use your imagination. Next Wednesday I will post my creation and also the DT. 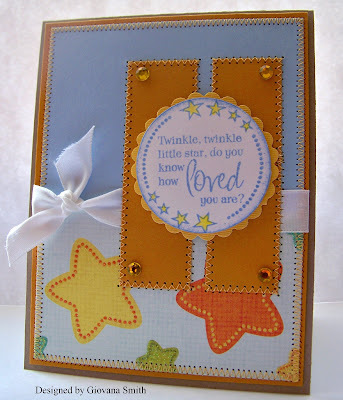 Now onto a baby card I made yesterday. 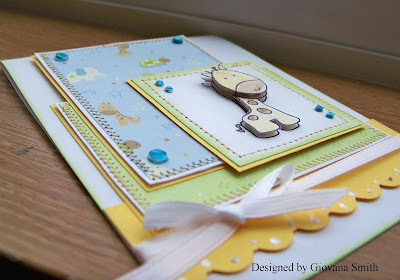 This is a cute baby card using Noah's Ark set. I colored the image with Prismacolor Pencils and it was blended with Colorless blender. The pretty paper is from My Mind's Eye from Just Dreamy Collection. I attached some White Satin Ribbon around and stitches in every panel. Card Stock: Kiwi Kiss, White, Tangerine Tango. Accessories: Sewing machine, Yellow thread, SU Dimensionals, Prismacolor Pencils, Colorless Blender pencil. Happy Mother's Day !! and Big Thanks. Happy Mother's Day to all of you my friends. I hope you are having a great day with the ones you love. DH and DD have prepared something special for me. They are making me breakfast, we will going to church, having a special dinner and then yummy chocolate Cream Pie for dessert. Yesterday I had to post about Mother's Day Memories, I couldn't do it, I was so busy, but today I want to share few things with you. I became a mom 5 years ago and I love this experience. I have a great and crazy girl who sometimes drives me crazy, but I love her deeply. Now I understand my dear mom. You never know what is coming in your life until you experience it. I have great memories with my mom and I want that Rebecca builds and keeps our great memories too. Yesterday, I spent a lot of time looking for a picture I have my mom, sadly I couldn't find it. I hope it is somewhere around the house because this is the only one I have. I lost my mom when I was 13, now I am 36 and still remembering great things about her and our time together. What I can tell you is she was and will be the best mom!! I miss her terribly, but I know she is in a better place, just with the Lord, rejoicing!!. 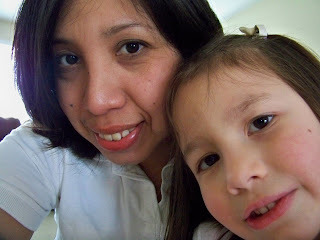 I want to share with you a picture, just mommy and Rebecca. We love to do this very much, we have a whole collection of silly pictures, but this one is the best to post here, LOL. Now, Big Thanks to all of you who participated in our First Mothers & Daughters Creations Blog Roll, you have until May 16th to upload your projects, everyday is a special prize, the more you play with us, more chances to win!!! Here is the list of the challenges already posted, hostesses and prizes!! Day 7: Recipe Card Challenge hosted by Melissa. Prize: SEI Morning Meadow epoxy stickers. 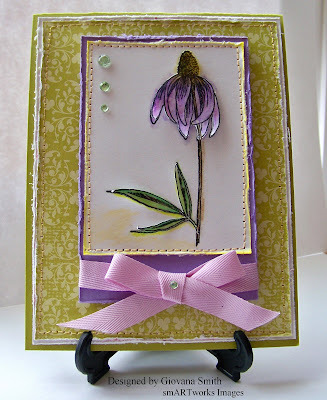 Day 8: Card with at least 3 flowers challenge hosted by Giovana. Day 9: Homemade Touch Gift Challenge hosted by Dawn. Prize: Stamps from Daisy Bucket. Thanks so much for all your support. Now Mothers & Daughters Creations wants to celebrate with you a great Mother's Day offering you for today ONLY Free Shipping in orders $50.00 or more. What a better way to celebrate your day!!! As I told you in my previous post, yesterday I made some Mother's Day Cards and also used different sketches I found on blog land. Here is a card I made using Heather Scott's sketch. She has an awesome blog and every Monday she posts a different sketch. 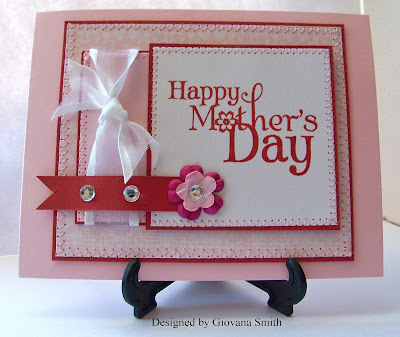 My card has a lot of pink and red, really pretty for a special MOM. In this card I positioned the square part on top of the rectangle part, it should be the other way. I realized I made a mistake after I finished my card. It was too late to fix it, but I like it this way anyway. Card Stock: Pink Pirouette, Riding Hood Red, White. Embellishments: SU Ribbon, Prima flowers, Clear Rhinestones. Accessories: Sewing machine, Pink thread, Mini glue dots. For my second card I used the sketch from CPS Systems Blog. My card is 5" x 5" square. 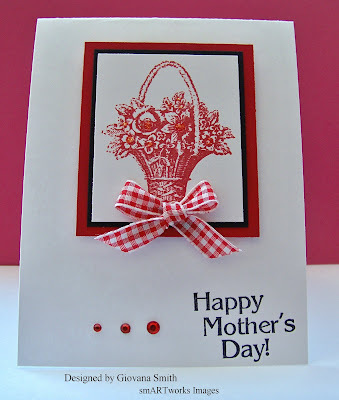 The paper in this card is from Rhubarb Tart Collection Pack ( Memory Box Paper). The big rhinestones are from Target $ spot. I got more than 100!! for only a dollar. 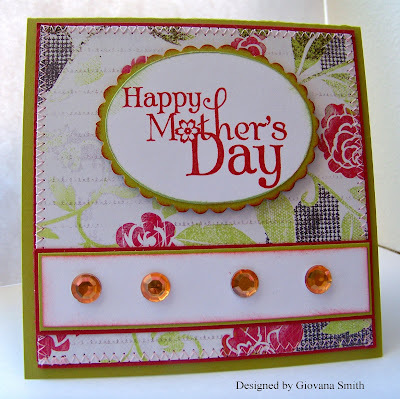 This rhinestones work great in big cards. The scallop oval was made with my Coluzzle and scallop scissors, then it was sponged with RHR ink. Card Stock: Kiwi Kiss, Riding Hood Red, White. Ink: Riding Hood Red, Certainly Celery ( sponging). Embellishments: Rhinestones (Target $ spot). Accessories: Sewing machine, Pink Thread, SU Dimensionals, Scallop Scissors (Provo Craft), Coluzzle (Oval set), sponges, Mini glue dots. 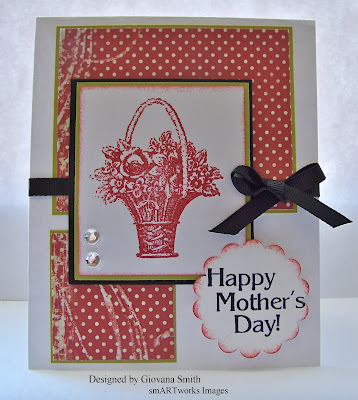 Also these cards qualified for Mother's Day card or projects on Fun-Frilled Blog. 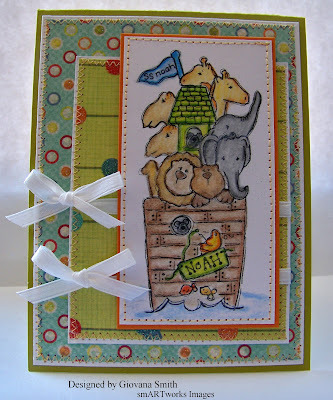 Labels: Blog challenges, Verve Stamps.